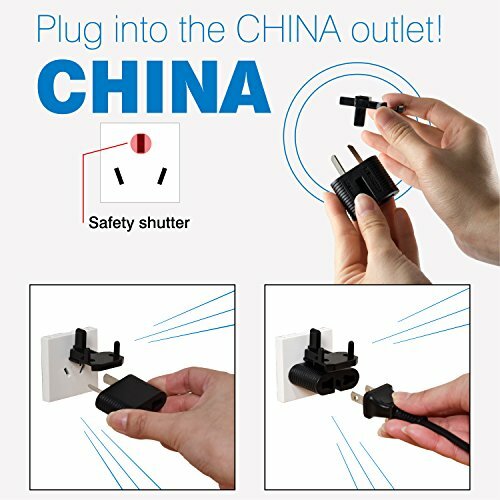 The ultra slim and light universal plug adapter will keep your devices connected and charged when you are traveling to different countries. 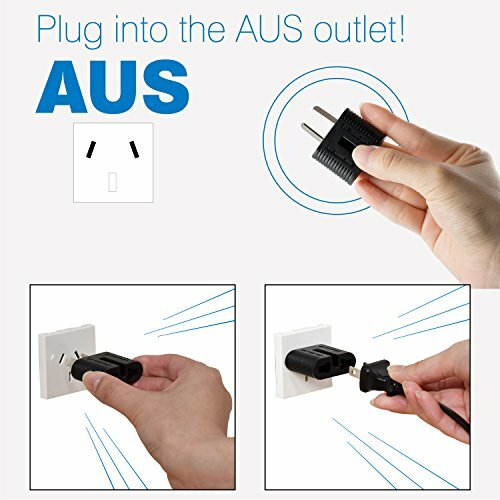 The 5 most common standards of sockets in the world are the “European” plug with two round pins, the “British” plug with three rectangular pins, the “Australian/Chinese” plug with two slanted pins, and the “American”plug with two vertical pins. The “SHINOBI” Plug Adaptor enables your appliances to be plugged in to the world’s 5 common types of electrical outlet by changing the pin configuration of your voltage power plug. The Plug Adapter includes three detachable units, the Round 2-prong adapter, the Flat 2-prong adapter and the Attachment. 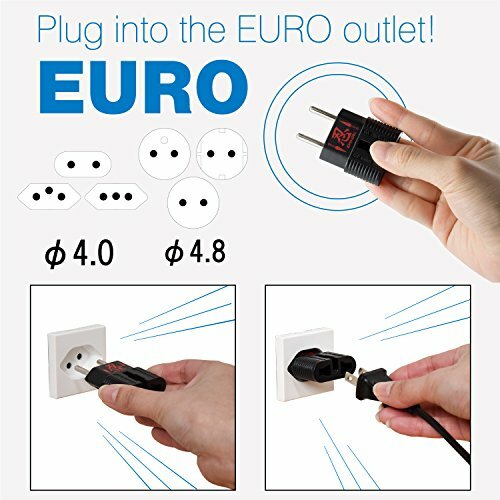 “European” plug: use the Round 2-prong adapter. 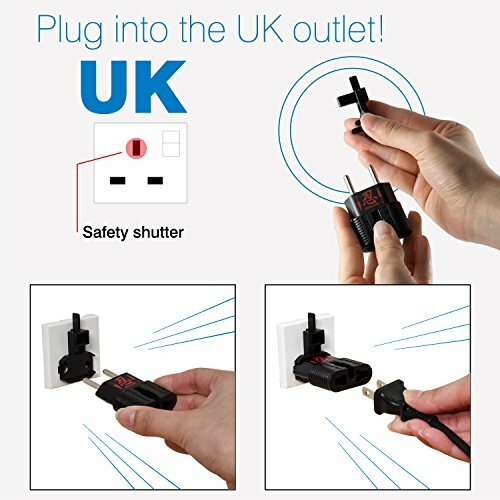 “British” plug: use a combination of the Round 2-prong adapter and the Attachment to open the safety shutters. 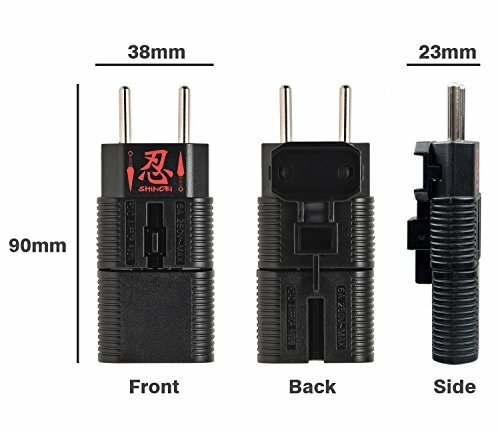 “Australian/Chinese ” plug: use the Flat 2-prong adapter, turn the two flat pins to V-shaped / inverted V-shaped. * If the vertical hole in the center has a safety “shutter” inside, please use the Attachment with it. Its ultra compact design fits into luggage and briefcases, weighting just 1.4 ounces and only 0.9inches thick, the compact design provides the portability to suit your travel style. AC Power Rating 250V 6A MAX. *The AC power port Do Not Convert Voltage. Does not convert to the Old British standards (“Type D” Indian plug and “Type M” big S. Africa plug). *Do Not use with Hair Dryers and other High wattage equipment. Designed in Japan. 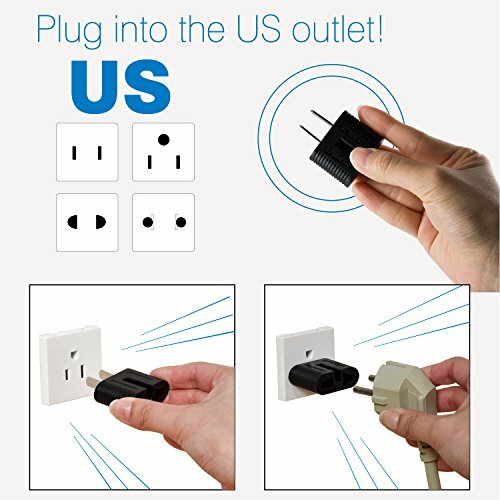 The Universal Plug Adapter “SHINOBI” can be used in over 150 countries and reconfigured into the Basic 5 types of plugs for use in Europe, Asia, China, Australia, and the UK. 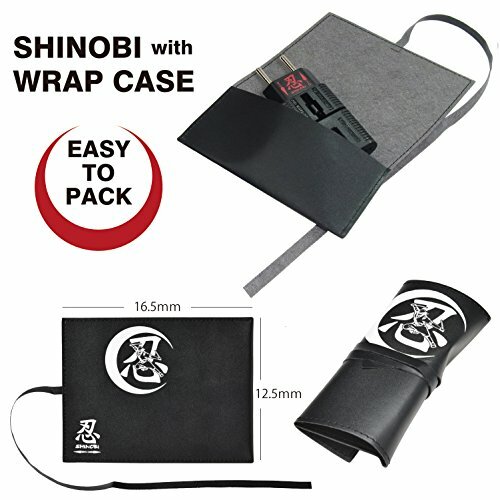 The original roll up plug case with Illustration of Ninja holds the plug adapter. Ultra compact design fits into luggage and briefcases, weighting just 40g (1.4 ounces) and provides the portability to suit your travel style. 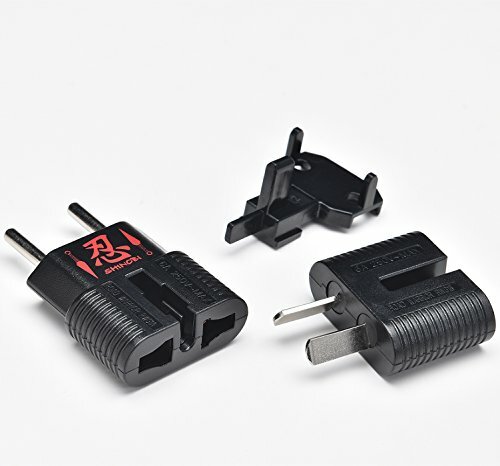 Accepts Accepts 2-prong or 3-prong plug from all countries worldwide except the Type M (big S. Africa Plug). AC Power Rating 250V 6A MAX – Does Not Convert Voltage. CE approval, RoHS compliant. 1(one) Year Warranty. *Please make sure that YOUR appliances can handle a range of voltage like “100v – 240v”. *Do Not use with Hair Dryers and other High wattage equipment.